Purpose: The aim of this study was to evaluate the true incidence of cervical artery dissections (CeADs) in trauma patients with an Injury Severity Score (ISS) of ≥16, since head-and-neck computed tomography angiogram (CTA) is not a compulsory component of whole-body trauma computed tomography (CT) protocols. Patients and methods: A total of 230 consecutive trauma patients with an ISS of ≥16 admitted to our Level I trauma center during a 24-month period were prospectively included. Standardized whole-body CT in a 256-detector row scanner included a head-and-neck CTA. 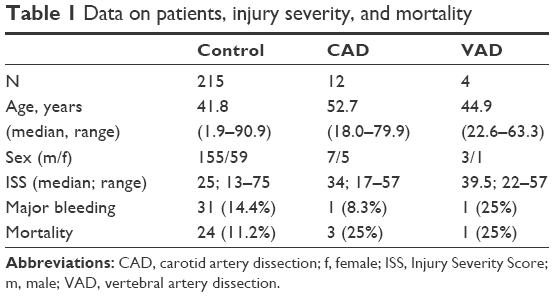 Incidence, mortality, patient and trauma characteristics, and concomitant injuries were recorded and analyzed retrospectively in patients with carotid artery dissection (CAD) and vertebral artery dissection (VAD). Results: Of the 230 patients included, 6.5% had a CeAD, 5.2% had a CAD, and 1.7% had a VAD. One patient had both CAD and VAD. For both, CAD and VAD, mortality is 25%. One death was caused by fatal cerebral ischemia due to high-grade CAD. A total of 41.6% of the patients with traumatic CAD and 25% of the patients with VAD had neurological sequelae. Conclusion: Mandatory head-and-neck CTA yields higher CeAD incidence than reported before. We highly recommend the compulsory inclusion of a head-and-neck CTA to whole-body CT routines for severely injured patients. Missed injuries are a major concern in the management of trauma patients; in 25% of the severely injured patients, at least one diagnosis remains undetected.1 Traumatic blunt carotid or vertebral artery injuries are associated with the mortality rates of up to 33% and a neurological morbidity of up to 38%,2–4 but initially, a high proportion of cervical artery dissections (CeADs) remains asymptomatic.2 While a contrast-enhanced multidetector computed tomography (CT) of thorax, abdomen, and pelvis is regarded as a diagnostic standard in severely and/or multiply injured patients,5 no compulsory consensus exists for the routine imaging and rule out of CeAD.6,7 Most of the polytrauma guidelines “recommend” a CT angiogram (CTA) in patients with an ill-defined “relevant trauma” to the head-and-neck region;8 it is known that even for highly experienced trauma surgeons, prediction of blunt injuries exclusively based on history and physical examination miss ~50% of injuries,9 underlining the need for standardized protocols and algorithms for head-and-neck CTA in trauma patients. Depending on the study population and preassessment, incidence of carotid artery dissections (CADs) and vertebral artery dissections (VADs) ranges from 1.7% and 4.9%.10,11 To the best of our knowledge, there are no results reported from prospectively mandatory integration of a head-and-neck CTA into whole-body scanning routine in severely injured patients presenting with an Injury Severity Score (ISS) of ≥16. A total of 230 consecutive multiply injured trauma patients admitted to our Level I trauma center during a consecutive 24-month period were prospectively included. All patients underwent a standardized whole-body CT scan in a 2×128 detector row scanner (SOMATOM Definition Flash; Siemens Healthcare GmbH, Erlangen, Germany), consisting of a noncontrast head CT and a one-phase contrast-enhanced whole-body (skull vertex to middle of thigh) CT including head and neck, adhering to the national S3 – Guideline “Polytrauma/Schwerverletzten – Behandlung”.8 The Independent Ethics Committee at the Regensburg University confirmed that for this specific scientific project, no ethics approval or commission’s opinion was necessary due to the fact that according to our applicable laws and guidelines, such anonymized retrospective study without any study-related clinical intervention or use of patients’ personal data does not have to be submitted to the ethics committee. Thus, no informed consent was obtained. Initially, a noncontrast-enhanced scan of the neurocranium was acquired in 0.75 mm slices (360 mAs, 120 kV, pitch 0.55, increment 0.75 mm, and field of view 230 mm). Aiming at a scanning time as short as reasonably possible in the setting of a routine integration of CT into emergency room algorithms, we use a single contrast-enhanced scan from head to toe with 120 mL of contrast agent (Accupaque 350; GE Healthcare Europe GmbH, Freiburg, Germany) automatically injected, followed by a flush with 30 mL of saline, both contrast agent and saline flush with the injection rates of 3 mL/second. The scan is started at a fixed delay of 55 seconds after completing the contrast agent injection. The field of view is 500 mm, the slice thickness is 5.0 mm, the increment is 5.0 mm, the pitch is 0.60 kV, and mAs are calculated and set automatically (CARE kV and CARE Dose; Siemens Helathcare GmbH) based on the topogram. A soft-tissue kernel with medium edge attenuation (B26f medium) was used for the calculation of axial, coronal, and sagittal views of the head and neck. Additional thick-slab axial maximal intensity projection (MIP) was rendered (10 mm) axial, sagittal, and coronal. Additional reconstruction were rendered using a B60f kernel for lung tissue (axial), a B60f sharp kernel for bones (axial and coronal, additional sagittal for spine), and a B30f kernel for soft tissue (axial, additional coronal for abdomen). Further reconstruction was calculated on the radiologists’ discretion depending on the findings or suspicions drawn from the standard datasets. Image interpretation was performed using a standard three-monitor work station using the Syngo and Syngo.via picture archiving and communication system (PACS; Siemens Healthcare GmbH). For statistical calculations, analysis, and plotting, GraphPad Prism Version 5.00a for Mac (GraphPad Software, Inc., La Jolla, CA, USA) was used. Arising from the observational character of this study, mainly, descriptive statistics was used, where appropriate multivariate ANOVA with post hoc Bonferroni comparisons was conducted. Groups were compared using two-sided Student’s t-test. P<0.05 was considered statistically significant differences. The study comprises 230 consecutive multiply injured trauma patients admitted to our Level I trauma center. Patients without injury of the cervical arteries were 41.8 years (median; range 1.9–90.9). A total of 155 of them were male and 59 of them were female. The mean ISS was 32±15.1. Major bleeding12 occurred in 31 patients (14.4%), and 24 patients died, yielding a mortality rate of 11.2%. Data on patients with CAD and VAD are listed in Table 1; age tends to be higher in patients with CAD and lower in VAD. The age distribution (Figure 1) reveals a major peak of multiply injured patients without CAD/VAD in the third decade of life with minor peaks in the sixth and eighth decades. Patients with CAD show a definite peak in the sixth life decade, while patients with VAD are distributed equally to the third, fourth, and sixth decades. Abbreviations: CAD, carotid artery dissection; f, female; ISS, Injury Severity Score; m, male; VAD, vertebral artery dissection. 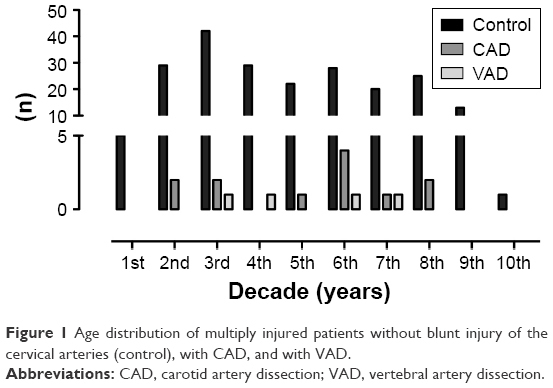 Figure 1 Age distribution of multiply injured patients without blunt injury of the cervical arteries (control), with CAD, and with VAD. Abbreviations: CAD, carotid artery dissection; VAD, vertebral artery dissection. Analyzing the underlying trauma mechanism shows a dominance of traffic accidents in all subgroups (Figure 2); patients were most often passengers of a car, while motorcycle accidents cause the second most multiply injuries. Further cause of higher energetic trauma is falls from heights >3 m, represented in all three subgroups. Major cerebral bleeding occurred in one patient with CAD (8.3%) and one patient with VAD (25%). 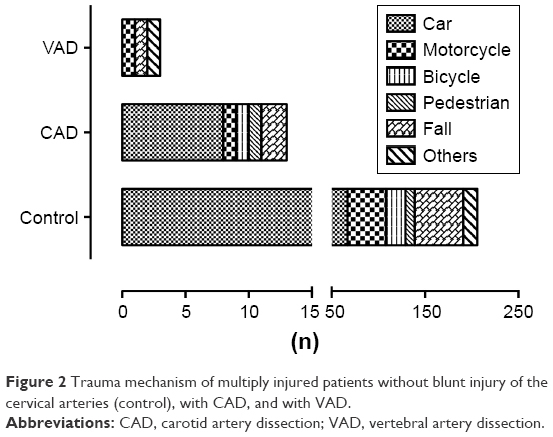 The injury severity in VAD is elevated to 40±24.7 (Figure 3). Figure 2 Trauma mechanism of multiply injured patients without blunt injury of the cervical arteries (control), with CAD, and with VAD. 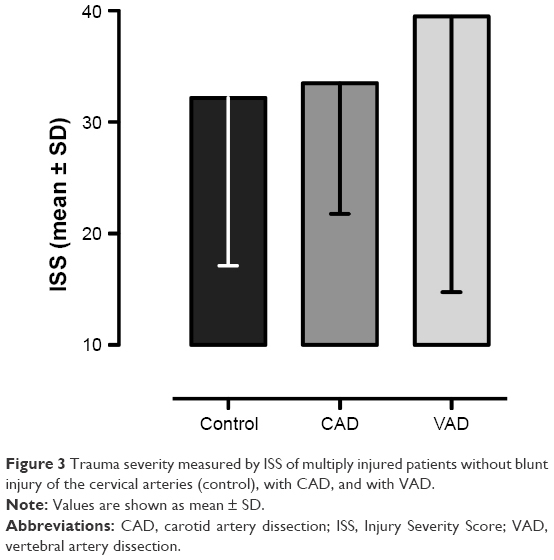 Figure 3 Trauma severity measured by ISS of multiply injured patients without blunt injury of the cervical arteries (control), with CAD, and with VAD. Note: Values are shown as mean ± SD. Abbreviations: CAD, carotid artery dissection; ISS, Injury Severity Score; VAD, vertebral artery dissection. Of the 230 patients included, 12 (5.2%) patients had a CAD and 4 (1.7%) patients had a VAD. Therein, one patient had dissections of both carotid and vertebral arteries. 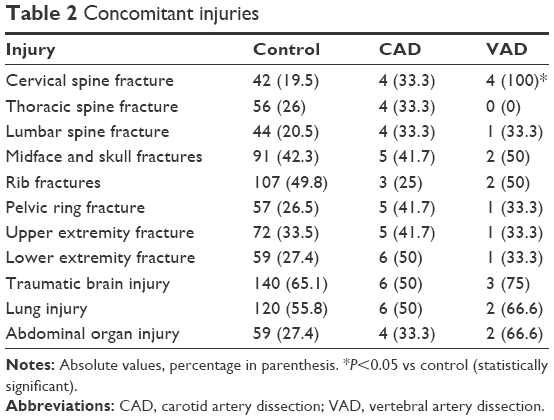 While distribution of concomitant injuries does not differ in patients with and without CAD, all patients with VAD had a fracture of the cervical spine (Table 2), located at C6, C2, C5-7, and C4-5. In CAD, the fractures were located at C7, C3-T1, C1-2 and C6-7, and C4-5. While injuries to the abdominal organs are only found in 27.4% of patients without CAD/VAD, abdominal organ injury, lung injury, and traumatic brain injury are found in two of the three patients with VAD, paralleling the elevated ISS in the group with VAD. Notes: Absolute values, percentage in parenthesis. *P<0.05 vs control (statistically significant). In case of CAD, overall mortality is 25%. One death was caused by cerebral ischemia due to high-grade CAD (8.3%) and consecutive ischemic insult in the cerebri media territory. A total of 41.6% of patients with traumatic CAD had neurological sequelae. All patients had to begin therapeutic anticoagulation therapy (100%) and one patient had to undergo interventional stent grafting of the common carotid artery (11.1%). One of the four patients with traumatic VAD died, yielding a mortality rate of 25%. In one patient (25%), VAD caused severe neurological sequelae. All surviving patients with VAD (3/3; 100%) had to be put on therapeutic anticoagulation. No interventional therapy was conducted for VAD. Injuries of the carotid or vertebral artery are reportedly associated with both high mortality rates and neurological morbidity rates.2–4 In multiply injured patients, diagnoses and decisions only based on history and clinical examination are prone to error with missed injuries in up to 47%.9 Thus, multiply injured patients at risk for carotid or VAD have to be identified via a combination of trauma and patient characteristics including the pattern of obvious injuries or all patients eligible for a whole-body CT need to be screened for carotid and vertebral artery injuries by making the CTA of supra-aortal arteries a part of the routine scan protocol.3 For example, as shown in Figure 4, a young man was diagnosed with an aortic arch rupture after a motorcycle crash and was secondarily admitted to our Level I trauma center for endovascular aortic repair; the in-house control CTA revealed a missed CAD on the right. Figure 4 Image of traumatic carotid artery dissection on the right side. Notes: (A) Axial polytrauma CT clearly depicts the dissection membrane in the right internal carotid artery (arrow). (B) No flow (arrow) can be seen distal of the CAD right before entering of the carotid artery into the petrous bone. (C) PD fs axial MRI sequence, acquired 1 week later, shows the right-sided CAD revealing the hyperdense carotid wall hematoma (arrow). Abbreviations: CAD, carotid artery dissection; CT, computed tomography; MRI, magnetic resonance imaging; PD fs axial, axial fat-saturated proton density. Figure 5 Bilateral vertebral artery dissection in cervical C5/6 facet fractures with dislocation. Notes: (A) No flow in the vertebral arteries from C5 to C7 (connected arrows). B delineates plane of axial CT image B. (B) Axial CT image shows no flow in both vertebral arteries (arrows). The key finding of our study is a combined incidence of 6.5% for CAD/VAD, with CAD alone having an incidence of 5.2%, when integrating the head-and-neck CTA into routine whole-body CT protocols for severely injured patients with an ISS of ≥ 16. Our values are beyond the ones reported from less strict-defined populations or even clinically preselected cohorts.10,11 Our data urge the importance of a reliable rule-out of CeAD for multiply injured patients. Furthermore, from the presented data, no reliable tracers for CAD from patient characteristics or trauma mechanism can be identified, as reported before by Cook et al.16 Paralleling our results, Dreger et al18 found that blunt vertebral artery injuries are rarely associated with symptoms, making it difficult to expect the diagnosis and warrant proper imaging. We thus urgently recommend the obligatory integration of a head-and-neck CTA in existing handling routines. Caputo et al19 concluded that the rigorous use of whole-body CT protocols yields lower mortality rates despite even higher ISS when compared with selective scanning in trauma patients. Designed and conducted as a single-center study providing data from a 2-year time frame, population size is limited. Larger cohorts are needed to back up our observations and findings as well as to support the urge for the integration of routine head-and-neck CTA into existing whole-body CT protocols. Despite all surviving patients with CAD or VAD in our population received therapy (eg, carotid artery stent-grafting) or were put on secondary prevention measures (therapeutic anticoagulation), it is not known whether both diagnosis and treatment of CAD lead to a reduction of mortality or neurological sequelae;20 these questions remain subject to further randomized clinical trials (RCTs). Compulsory integration of head-and-neck CTA into whole-body MDCT protocols for patients presenting with an ISS of ≥16 reveals an incidence of combined 6.5% for CAD/VAD, with CAD alone having an incidence of 5.2%. Both CAD and VAD are associated with high mortality rates of 25% and a large percentage of patients with severe neurological sequelae. Since all surviving patients are subjected to therapy, the diagnosis of CeAD must not be missed. It is not possible to identify patients with CeAD from patient characteristics, concomitant injuries, or trauma history. We thus highly urge on the integration of head-and-neck CTA into existing polytrauma MDCT protocols until further RCTs shed light on the relevance of diagnosing and treating all CeADs. Euler SA, Kastenberger T, Attal R, Rieger M, Blauth M, Petri M. Do we still need autopsy in times of modern multislice computed tomography? Missed diagnoses in the emergency room. Arch Orthop Trauma Surg. 2017;137(1):43–47. Alimi Y, Di Mauro P, Tomachot L, et al. Bilateral dissection of the internal carotid artery at the base of the skull due to blunt trauma: incidence and severity. Ann Vasc Surg. 1998;12(6):557–565. Fabian TC, Patton JH, Croce MA, Minard G, Kudsk KA, Pritchard FE. Blunt carotid injury. Importance of early diagnosis and anticoagulant therapy. Ann Surg. 1996;223(5):513–525. Parikh AA, Luchette FA, Valente JF, et al. Blunt carotid artery injuries. J Am Coll Surg. 1997;185:80–86. Dreizin D, Munera F. Blunt polytrauma: evaluation with 64-section whole-body CT angiography. Radiographics. 2012;32(3):609–631. Berne JD, Cook A, Rowe SA, Norwood SH. A multivariate logistic regression analysis of risk factors for blunt cerebrovascular injury. J Vasc Surg. 2010;51(1):57–64. Geddes AE, Burlew CC, Wagenaar AE, et al. Expanded screening criteria for blunt cerebrovascular injury: a bigger impact than anticipated. Am J Surg. 2016;212(6):1167–1174. AWMF. S3 Leitlinie Polytrauma und Schwerverletztenbehandlung [S3 Guideline Polytrauma and severely injured treatment]. Register-Nr. 012/019. Version: 25.08.2017. http://www.awmf.org/leitlinien/detail/ll/012-019.html. German. Beal AL, Ahrendt MN, Irwin ED, et al. Prediction of blunt traumatic injuries and hospital admission based on history and physical exam. World J Emerg Surg. 2016;11(1):46. Grabowski G, Robertson RN, Barton BM, Cairns MA, Webb SW. Blunt cerebrovascular injury in cervical spine fractures: are more-liberal screening criteria warranted? Global Spine J. 2016;6(7):679–685. Fleck SK, Langner S, Baldauf J, Kirsch M, Kohlmann T, Schroeder HW. Incidence of blunt craniocervical artery injuries: use of whole-body computed tomography trauma imaging with adapted computed tomography angiography. Neurosurgery. 2011;69(3):615–623; discussion 623–624. Schulman S, Kearon C; Subcommittee on Control of Anticoagulation of the Scientific and Standardization Committee of the International Society on Thrombosis and Haemostasis. Definition of major bleeding in clinical investigations of antihemostatic medicinal products in non-surgical patients. J Thromb Haemost. 2005;3(4):692–694. Häske D, Stuke L, Bernhard M, et al. Comparison of the prehospital trauma life support recommendations and the German national guideline on treatment of patients with severe and multiple injuries. J Trauma Acute Care Surg. 2016;81(2):388–393. Christensen MC, Ridley S, Lecky FE, Munro V, Morris S. Outcomes and costs of blunt trauma in England and Wales. Crit Care. 2008;12(1):R23. Martinelli O, Venosi S, BenHamida J, et al. Therapeutical options in the management of carotid dissection. Ann Vasc Surg. 2017;41:69–76. Cook A, Osler T, Gaudet M, Berne J, Norwood S. Blunt cerebrovascular injury is poorly predicted by modeling with other injuries: analysis of NTDB data. J Trauma. 2011;71(1):114–119. Kaul A, Abbas A, Smith G, Manjila S, Pace J, Steinmetz M. A revolution in preventing fatal craniovertebral junction injuries: lessons learned from the head and neck support device in professional auto racing. J Neurosurg Spine. 2016;25(6):756–761. Dreger T, Place H, Mattingly T, Piper C, Brechbuehler J. Analysis of cervical angiograms in cervical spine trauma patients, does it make a difference? Clin Spine Surg. 2017;30(5):232–235. Caputo ND, Stahmer C, Lim G, Shah K. Whole-body computed tomographic scanning leads to better survival as opposed to selective scanning in trauma patients: a systematic review and meta-analysis. J Trauma Acute Care Surg. 2014;77(4):534–539. Berne JD, Norwood SH. Blunt vertebral artery injuries in the era of computed tomographic angiographic screening: incidence and outcomes from 8,292 patients. J Trauma. 2009;67(6):1333–1338.